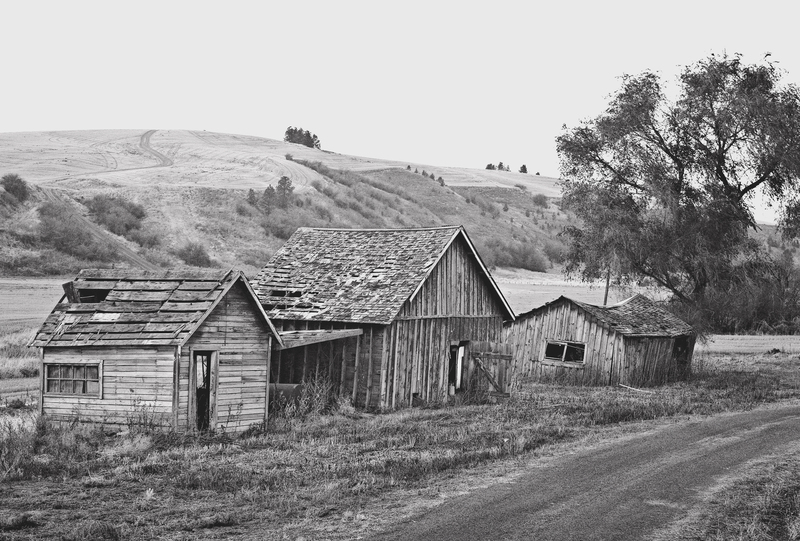 The Palouse is a fascinating region of rolling hills of loess (windblown silt) carpeted with wheat fields and and dotted with old weathered farm buildings, located in southeastern Washington. Carved through this undulating landscape are the canyons and gullies of the ice age deluge from Lake Missoula, culminating in the rugged moonscape around Palouse Canyon and the spectacular scenery of the Columbia Gorge. These old buildings caught my eye as I navigated the winding highways of this region. This was taken with my 1928 No. 1 Kodak on XP-2 at f/22. Very nice rendering of that Palouse scene. The Kodak Anastimats of that era produce a very distinctive look. I have one on a No.2 Hawkeye Special that is probably a couple years newer than yours. I need to get it out more often.